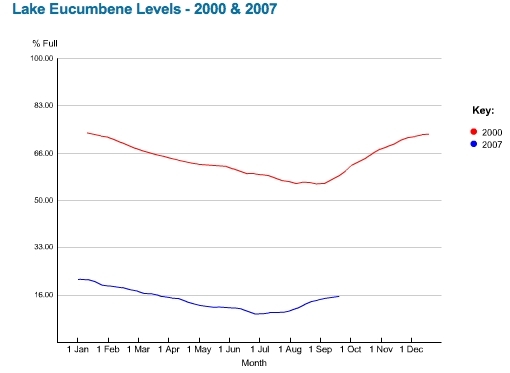 Salinity in South Australia’s Lower Lakes was now in the range of 2300 to 2500 EC, with much higher levels immediately upstream of the barrages, where leakage over, under or through the structures had resulted in seawater mixing with the much fresher water of Lake Alexandrina, warned the River Murray System Drought Update No. 10 October 2007. Monitoring will warn of problems: “Considerable efforts have gone into minimising leakage, but seepage under, and storm waves over, the barrages cannot be prevented and will continue to bring salt in to the lake. Regular water quality monitoring undertaken along the entire River Murray will provide early indications of salinity increases or any other problems, such as algal blooms. Salted water now a part of life: “All people using the waters of the River Murray should be aware of the increased potential for water quality problems and the difﬁculty dealing with these issues while ﬂows remain very low. Since May there has been very little ﬂow beyond Wellington into Lake Alexandrina. The lake level was steady over winter due to local rain and low rates of evaporation, but has now begun to gradually fall. Between Lock 1 and Wellington OK, but to get worse: The water in the reach between Lock 1 and Wellington has been of reasonably good quality, with salinities of less than 500 EC. 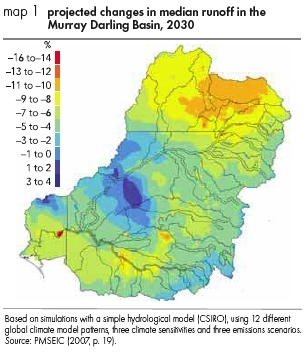 As water from this reach evaporates or is pumped to Adelaide and other urban centres in South Australia, it is slowly replaced with poorer quality water from upstream,” warned the River Murray System Drought Update No. 10 October 2007. What’s ahead: Under continuing dry conditions, salinities are forecast to rise, and ﬂows to South Australia will be aimed at maintaining the water quality within levels suitable for human consumption. In isolated areas of the lakes salinity levels may also be higher due to local groundwater inﬂows. MDBC will provide further drought updates in coming months. Additional information is available at http://www.mdbc.gov.au and from the relevant Australian and State Government Agencies. Prior to commissioning, trigger levels for effluent discharge for all phases of development must be included in the EIMP together with agreed response strategies and timeframes if trigger levels are exceeded or maximum limits reached. In accordance with the EIMP, Gunns Limited must obtain (from overseas pulp mills already using technologies similar to that proposed) effluent samples, and conduct chemical analyses and whole effluent toxicity testing to identify the key contaminants and their concentrations and the effluent dilutions needed in the mixing zone for the proposed mill. Gunns Limited must report on the temporal variability in both the contaminant concentrations and toxicity in the effluents from these mills. In accordance with the EIMP, to determine the properties affecting the fate of fine particulate organic matter in effluent, Gunns Limited must undertake laboratory studies, agreed to by the Department, to assess the likely settling and flocculation properties of fine particulate organic materials in equivalent effluent.